One of the most painful feelings in the entire world is when you accidentally step onto a Lego brick with your bare foot. AGH the shooting needle of plastic is a horrific reminder of how big a weakling your feet are. No worries though. 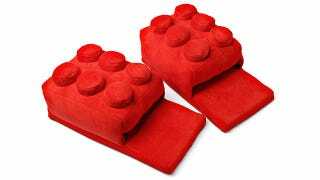 For true Lego fanatics, they can turn to Lego brick house slippers.